You may recall Prometheus with both awe and astonishment, a film with astounding moments of beauty and horror and brilliance bumping up against stupidity and sloppiness and half-baked ideas. 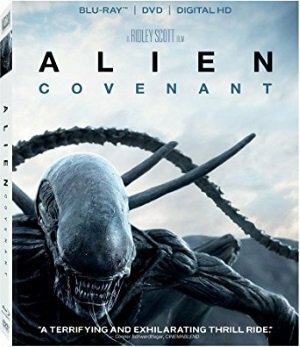 Alien: Covenant (2017), the second film in the Alien prequel series, takes place a decade after the events of Prometheus (2012) and continues writing the xenomorph origin story with a new cast of potential hosts (a colony ship with a population on ice waiting to wake on a new world) put through a plot that borrows elements from both Prometheus and the original films. It’s a smarter film, and if it never quite matches the conceptual and visual genius of Prometheus at its best, neither does it slip into the foolishness of its worst moments. This is the sixth official film (we’re ignoring the Alien vs. Predator films) in what is becoming a galaxy-spanning franchise, the second film in the prequel story, and the third directed by Ridley Scott, director of the original film. It opens with the skeleton crew awakening early, just as it did in Scott’s original Alien, and sending a search party down to a nearby planet sending out a distress signal, which this time is a verdant world teaming with plant life but, eerily, no animals or insects or birds. What it does have are the insidious spores of Prometheus (also directed by Scott) which colonize the unlikely humans as hosts for this alien life form, and a lone humanoid living in the ruins of a dead civilization: David (Michael Fassbender), the android of Prometheus who walks the wasteland like a rogue prophet and makes contact with the human team.